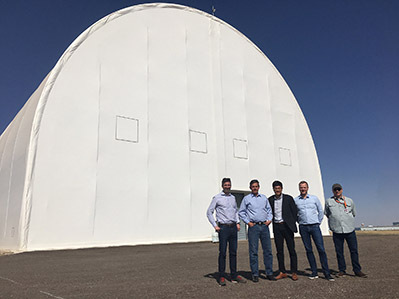 U.S. Sen. Martin Heinrich, D-N.M., toured the development and assembly facility of Sceye Inc. Wednesday, an aerospace company headquartered at the Roswell International Air Center. Sceye Inc. develops technologies to better the capabilities of drones and satellites and is currently working on a high-altitude airship that will harness solar energy and use advanced materials in all of its components. The company will employ as many as 50 engineers and local support staff and has already created an estimated 40 local construction and maintenance jobs. As the ranking member on the Joint Economic Committee, Heinrich is working to diversify New Mexico’s economy and foster advanced manufacturing industries in the state. In December, Heinrich helped secure an $800,000 grant from the U.S. Economic Development Administration (EDA) to support the renovation of a hangar facility at the Roswell International Air Center. The EDA grants allow companies to expand operations, attract private investment, and create new, high-paying jobs.